The Retired, State, County and Municipal Employees Association of Massachusetts announced its unanimous endorsement of Steve Kerrigan for lieutenant governor, noting that the former longtime aide to Sen. Ted Kennedy is the right person to help lead Massachusetts forward. The endorsement comes on the heels of Kerrigan’s victory at the Massachusetts Democratic State Convention in June. The former Lancaster selectman won the most support among the four candidates for lieutenant governor. JUNE 30, 2014: House and Senate budget negotiators reached an agreement on the Commonwealth’s $36.4 billion fiscal 2015 budget over the weekend. The measure will be approved by both the House and Senate, and then sent to Governor Patrick later today. JUNE 20, 2014: “In our July 2014 issue of the Voice, we included an article reporting on the Association’s successful enactment in 1984 of a law that prohibited a bank from imposing any fee or assessment on a checking or savings account of a person 65 or over,” according to Publisher Nancy Delaney. “We termed it the "Bank Fee Waiver Law". 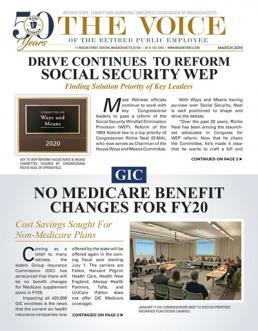 JUNE 13, 2014: At its monthly meeting held today, the state’s Group Insurance Commission (GIC) announced that enrollment in the retiree-pay-all dental program increased by some 2,300 retirees for Fiscal Year 2015, which begins July 1. Now entering its 11th year of existence, the retiree dental program is not only a great success story for the GIC, but also for our Association. The program was created at the behest of our Association in 2003 and has grown to nearly 27,000 enrollees. JUNE 6, 2014: Following the passage of the Fiscal Year 2015 budget in both the House and Senate, legislative conferees are now negotiating a final unified state budget that will likely receive final approval in late June or early July. 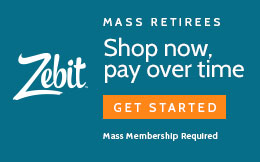 APRIL 10, 2014: In the Sunday, March 23, 2014 edition of the Boston Globe, conservative opinion columnist Jeff Jacoby penned an op-ed titled "Public pensions are eating taxpayers alive". Winchester selectmen have scaled back a plan to make retirees pay half the cost of their health insurance premiums, a plan that ignited a backlash from retired town workers. The Board of Selectmen now proposes increasing premiums to 30 percent for people who retired before 2004, and phasing in the plan over an 18-month period, starting July 1. Later retirees would still pay 50 percent of their premiums, but it would be phased in over two years, according to the proposal. MARCH 27, 2014: On behalf of our members, the Association offers the deepest condolences to the families of Boston Fire Lt. Edward J. Walsh and Firefighter Michael R. Kennedy, as well as to the Boston Fire Department. The two members of Boston Fire Fighters Local 718 were tragically lost on Wednesday, while fighting a nine-alarm fire on Beacon Street in Boston’s Back Bay. MARCH 6, 2014: State and municipal retirees, receiving their health insurance through the state’s Group Insurance Commission (GIC), received welcome good news on Wednesday – health insurance premiums for FY15 will remain largely unchanged. We’ve been receiving calls and emails from Boston members who receive an accidental (work related) disability pension. They were surprised to see that the federal income tax statement they recently received from the Boston Retirement Board, known as Form 1099-R, was totally different from the forms they received in previous years. FEBRUARY 21, 2014: Heeding calls from retiree advocates (including our Association) and Democratic Leaders, President Obama has dropped a provision from his federal budget proposal that would have used the chained CPI to calculate Social Security COLAs. President Barack Obama is done pretending that he’ll get any new budget cooperation from House Republicans. His proposed 2015 budget, due to be released next month, will stick to the economic strategy the White House has laid out without the compromise suggestion he floated last year, White House officials said Thursday. FEBRUARY 19, 2014: Annual open enrollment for the state’s Group Insurance Commission (GIC) is set to run from April 9 – May 7, 2014. If you receive your insurance through the GIC this is your opportunity to make changes to your insurance coverage for the coming fiscal year. February 5, 2014: For more than 6 years, we’ve been reporting on the activities of the Middleborough Retiree Insurance Group (MRIG) which organized back in ’07. “Our Association has a tradition of working with local retiree groups, particularly on the issues of municipal health insurance and local pension COLAs (Cost-of-Living Adjustments),” according to President Valeri. “That relationship includes Middleboro. FEBRUARY 1, 2014: This past week Association President Frank Valeri and Legislative Liaison Shawn Duhamel met with members of the Massachusetts’ Congressional Delegation in Washington, DC. Valeri and Duhamel were in the nation’s capital to attend the annual legislative conference of the National Conference of Public Employee Retirement Systems (NCPERS), to which the Association belongs. They met with the offices of all nine members of Congress, as well as Senior Senator Elizabeth Warren. The Massachusetts state pension fund posted a 15.2 percent investment gain for 2013, as strong markets helped the fund’s managers add $7.9 billion to the retirement accounts of public employees. US stocks provided the biggest boost to the fund, climbing 33.7 percent during the year, followed by investments in private equity, which rose 21.1 percent. JANUARY 22, 2014: Within the final budget proposal of his eight-year tenure as governor, Deval Patrick chose to include two provisions of critical long term importance to public retirees and surviving spouses. As he has consistently done in the past, the governor has recommended a full 3% cost-of-living adjustment (COLA) for state and teacher retirees who retired before July 1, 2013. Like 2013, the new COLA will be paid on a base of $13,000. JANUARY 2, 2014: The Joint Committee on Public Service is off to an aggressive start early in 2014 with a public hearing scheduled for Tuesday, January 7th at 11:00 AM. Tuesday’s hearing will focus on legislation impacting group classification of active employees. As members know, Massachusetts’ public retirement is organized into four groups (1-4), which are set in statute by the legislature. DECEMBER 10, 2013: The Association’s Ralph White has been reelected to a new 3-year term on the State Retirement Board. White topped the ticket in a landslide, winning by more than 11,000 votes. He received 79% of the total votes cast by the members of the State Retirement System. White has served on the Board since 1996. DECEMBER 4, 2013: A federal bankruptcy judge has granted approval for the City of Detroit to move forward with its bankruptcy protection plan – a plan that will include cuts to the pensions of existing city retirees and future benefits of active employees. NOVEMBER 21, 2013: An article in today’s DCDB Daily Free E-Newsletter says that Massachusetts Treasurer and Receiver General Steve Grossman, Chairman of the Pension Reserves Investment Management (PRIM) Board, manager of the state’s more than $54 billion Pension Reserve Investment Trust (PRIT), has lodged support for mission-based investing focused on climate change. NOVEMBER 12, 2013: Hundreds of public employees from across all walks of state and local government made their concerns known at a packed public hearing on retiree healthcare reform on October 31st. The hearing, on H59, was held before the Joint Committee on Public Service. Chaired by Senator William Brownsberger (D-Belmont) and Rep. Aaron Michlewitz (D-North End), the Public Service Committee is now conducting a thorough review of the bill. OCTOBER 30, 2013: Today, the Social Security Administration announced that the Consumer Price Index (CPI) for the previous 12 months (September ’12 to Oct ’13) is 1.5%. The announcement follows recent reports by the Federal Reserve detailing historically low inflation.